The Horn Fair of South London: London's first Carnival ? The Horn Fair in South London: London's first Carnival ? What Gods did the Druids worship ? 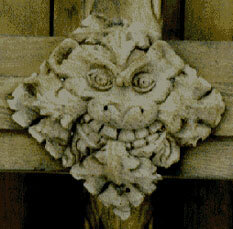 The Green Man on a Church Tilton on the Hill, England. It is widely thought that Carnival first came to London when the Notting Hill Carnival was started back in the 1960's. However, there is evidence that Carnival in London has much older roots going back to the days when the Celtic population of London and the surrounding areas in pre-Saxon London (circa. 5th century AD), worshipped the Horned God or Green Man - the Pagan fertility God closely connected with Greenwich (the Green Village) and the legends of the Isle of Dogs. Cuckold's Point - connected with Stag worship and the Horned God ? I will argue in this essay that the first Carnival in London was with the Horn Fair which marched in carnival style from Cuckold's Point in what was then Bermondsey to Charlton until it ended almost 180 years ago. Although The London Encyclopedia, says "it's origins are uncertain"(1), this festival is almost certainly something that was carried forward from an older Celtic festival in distant times. Although the fair was stopped by the authorities in 1872, with the support of Greenwich Council, it has started again on an annual basis again in Charlton in Hornfair Park. There is only one other place l have been able to find in London which has this name and it's called Cuckold's Haven, which is on the River Roding near Barking in East London. For many years l have been intrigued as to why the Horn Fair started at Cuckold's Point in Rotherhite. It is directly opposite the new Canary wharf development off Rotherhithe Street in south London. As the starting point of the Horn Fair it must have had some early significance, whose meaning has now been lost. Maybe the start of the Fair here give's us a clue to it's origins: Perhaps the Isle of Dogs was a place where scared rituals dedicated to the Horned God were carried out before the participants crossed the Thames by boat - their arrival heralding the start of the Fair. According to some local tradition, the fair was started after King John seduced the wife of a local miller and, in recompense, gave her wronged husband all the land visible from Charlton to Rotherhithe. The miller's neighbours named the riverside boundary of his new land Cuckold's Point and established the annual Horn Fair (horns being the symbol of cuckoldry). This seems highly unlikely as this would have included both the royal palace in Greenwich and the naval dockyards in Deptford. If this miller was given all this land as the story claims then he would be a person who was very rich and as a result of becoming of the areas biggest landowners his identidy would be well known and recorded in local journals. Cuckold's Point may have some geomantric significance according to claims made by the London Psychogeographical Association. They looked into the the alignment of Canary Wharf, say it is aligned with St Paul's Cathedral and Cuckold's Point to the west, but that it also traverses the top of Greenwich peninsular to the east. To wear the horns. To be a cuckold: In the rutting season, the stags associate with the fawns: one stag selects several females, who constitute his harem, till another stag comes who contests the prize with him. If beaten in the combat, he yields up his barem to the victor, and is without associates till he finds a stag feebler than himself, who is made to submit to similar terms. As stags are horned, and made cuckolds of by their fellows, the application is palpable. When the procession arrived in Charlton from Bermondsey, the parade would march around the Church of St. Luke three times "before getting down to the serious business of having fun". St. Luke's feast day is on October 18th, and he is often depicted writing beside an Ox or Cow, whose horns are very prominent. The fair reached its heyday during the reign of Charles II (1660-1685), during which thousands of people visited Charlton &endash; presumably following the procession as it marched down through Deptford and up Blackheath Hill &endash; dressed as "King's, Queen's and Miller's", with horns on their heads. The site of fair in Charlton (now part of the grounds of Charlton House), was near a 17-acre iron-age fort, of which nothing now remains. (3) A smaller scaled down version of the Horn Fair is held every year in Charlton. There are other connections with the Pagan fertility rites and worship of the Horned God. There is a cave known as Jack Cade's cavern underneath the site of a old stone circle at Maidenstone Hill on the edge of Blackheath Common, known today as The Point. Described as "of great antiquity and unknown use", it was carved out of chalk by tools made of antler, and it contains four large and three small chambers, with a well at its farthest end. The carving of the Horned God is just within it's entrance. The site was sealed up at the beginning of the century. One wonders why this cave was named after Cade. Did he worship there before marching onto London ? On a final note, a believe that South London's Horn Fair should be restored on its original route from Bermondsey to Charlton every May Day. It is an event that should be modeled on the Notting Hill Carnival, with Steel Bands, Samba Schools, Sound Systems, and dancers dressed like those in the Horn Dance in Abbots Bromley. It would give London a second Carnival and would keep alive the Horn Fair well into the present millennium. 1 The London Encyclopedia, Edited by Ben Weinrub and Christopher Hibbert, Paperback, London, England, 1983, p140. 3 Robin Hood: The Spirit of The Forest, Steve Wilson, Neptune Press, London, England, 1993, p22.